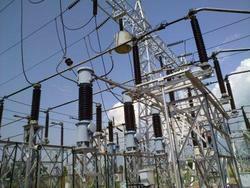 132/33kV WUDIL AIS Substation in Nigeria on behalf of Supreme & Co.Pvt. Ltd., Kolkata. 132/33/6.6kV GIS substation and downstream ring main system for Construction power system of NMDC for 3 MTPY Integrated steel plant at Nagarnar, Chattisgarh. (On behalf of KEC, International, Gurgaon). 132/33kV GIS MRSS of Tata Steel Ltd. at Noamundi, Jharkhand for Joda & Noamundi Mines expansion project (on behalf of Siemens Ltd). 1x400kV Bus reactor bay extension of PGCIL in Amritsar, Hissar, Nalagarh and Jalandhar on behalf of Sterling & Wilson Ltd.
For details of many other current and completed projects please refer the "Projects" section. Our design processes are fully computerized and designs are carried out as per relevant national/international standards and Customer's requirement. We being an ISO 9001 certified company, our work procedures are guided by the guidelines of the ISO standard.